Lisa Wade presents certificates of graduation to the students at the 2018 Ya Ne Dah Ah School of Chickaloon Village graduation ceremony. 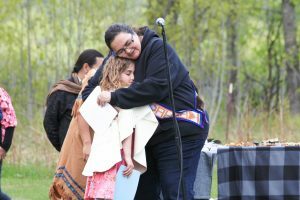 In 2014, Lisa Wade, director and member of the Chickaloon Village Traditional Council, was invited to join a new organization whose mission is to address the concerns in the Mat-Su Borough linked to child maltreatment. At first she was a little apprehensive about the project because Alaska Native people are no strangers to negative statistics and perspectives regarding child maltreatment and neglect. Lisa decided not to shy away from this opportunity to build a better community because the group decided to approach these serious issues in a way that cultivated a positive and engaged conversation. This organization would become R.O.C.K. Mat-Su (Raising Our Children with Kindness): a collaborative effort made up of individuals from the fields of child protection, early childhood education, behavioral health, and primary care. Lisa thrives on relationships and community, and it is her goal to create a culturally centered community that is equitable and welcoming to the growing and diverse population in the Mat-Su area. She believes that the Ahtna and Dena’ina people of the region have a rich and vibrant culture, spirit, and values that can make a positive contribution to the fabric of the community. Serving on the R.O.C.K Mat-Su steering committee allows her to bring her Alaska Native perspective to the organization, which then can be shared in positive ways with the community at large through family events. Lisa actively partners with R.O.C.K. Mat-Su on several projects and community celebrations, such as the upcoming workshop titled Undoing Racism. This summer, Lisa partnered up with R.O.C.K Mat-Su for the Chickaloon Village Traditional Council’s 10th Annual Tribal Celebration and Health Fair. R.O.C.K Mat-Su hosted a family dance party during the celebration which saw hundreds of attendees. Other activities during the event included kid’s games, health informational booths, and free community BBQ, which was a huge success. Lisa is just one individual in a network of people who have dedicated the time to build a better community. The collaboration of these local organizations and volunteers, along with the support of the community, helps keep families healthy and support a happier Mat-Su Borough. For more information about R.O.C.K Mat-Su visit healthymatsu.org or follow them on Facebook for a complete list of upcoming events.